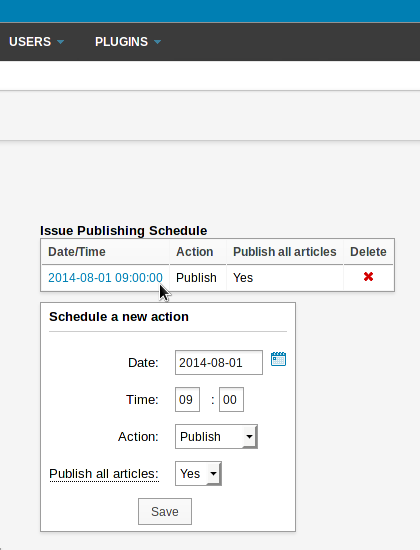 Once you have successfully created your publication, click on Content, then Publications in the main navigation menu. Click on the name of your new publication in the Publication List (e.g. "The Prague Times"). This will lead you to the Issue List, which will be empty to begin with. Click on the Add new issue link. If you are creating the very first issue, you will see a page with fields for basic information which you will need to enter. The Name is the name of the issue in the particular Language you specify in the drop-down box underneath. The Number is a unique identifier for this issue. If this is the first issue you've ever published, then number "1" would be appropriate. The issue number cannot be changed once it is specified. If you are planning to add older issues of your publication at a later stage to the same Newscoop server, you should continue the numbering series. 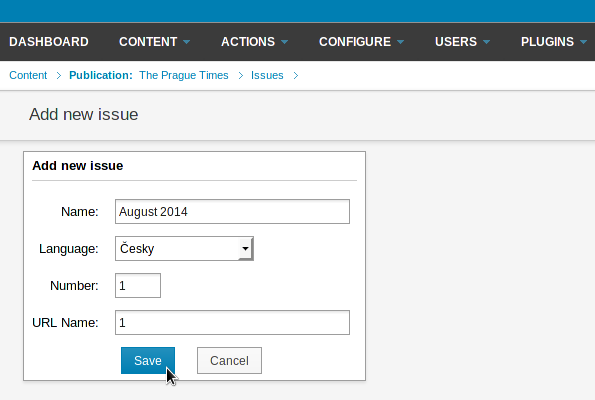 For example, if you published issue 154 of the "The Prague Times" before moving to Newscoop, you should assign number 155 to the first issue you are creating with Newscoop. This is because by default, Newscoop uses the highest available published issue number to determine which issue provides the front page articles for the publication. Therefore it is important to start with issue numbers that are high enough to enable back-issues to be added later. Clicking the Save button takes you to the Change issue details page, where various options for the issue are set. 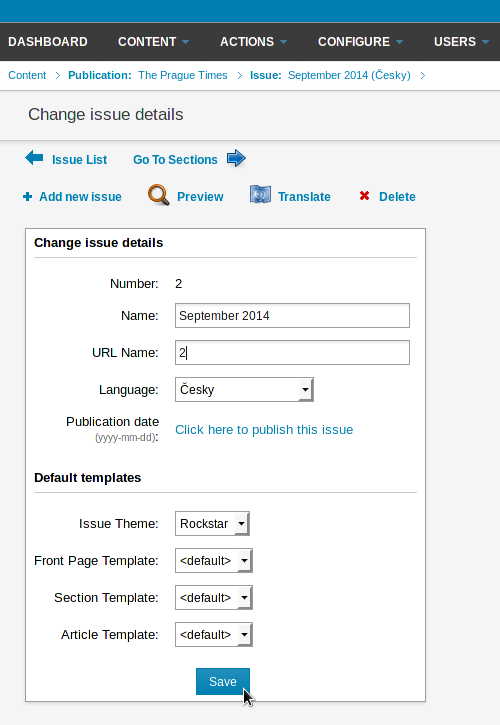 On the left hand side, there are settings for the default templates for the front page, sections and articles. If you do not have your own Newscoop theme yet, you can select templates from one of the themes that are provided with Newscoop (see the chapter Choosing a theme). On the right hand side of the Change issue details page are boxes which enable you to set the publishing schedule for the issue. An issue can be set to be published at a specific date and time, and unpublished at another date and time. 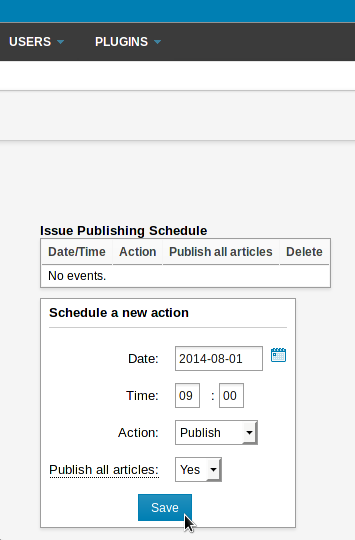 Existing actions are shown in the Issue Publishing Schedule table. Individual actions can be deleted from the table by clicking the red x icon on the right side. If this is not the first issue you have created, you will see a different page after clicking the Add new issue link in the Issue List, with links for two different actions: Use the structure of the previous issue, or Create a new structure. Use the structure of the previous issue will be the usual option to choose once you are ready to publish additional issues, because it automatically creates a new issue with the same sections as the preceding one. For this reason, you should create all the sections you require before copying the structure into additional issues. Clicking this option opens a page which enables you to specify the new issue number. The sections of the new issue will be empty, so that you can begin to add articles. 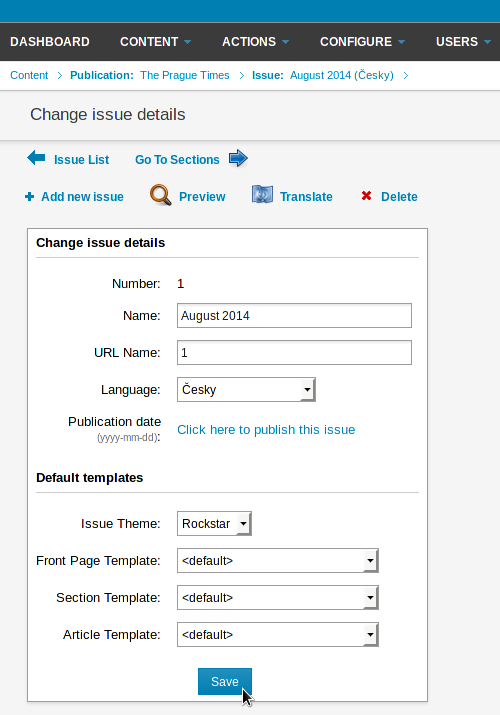 Before that, the first step you should take is to set the Name of the new issue, because this field is not automatically updated; it will start out with the same name as the last issue. You will also need to set a unique URL Name for the issue. After changing the Name and URL Name fields, click the Save button to update the new issue.